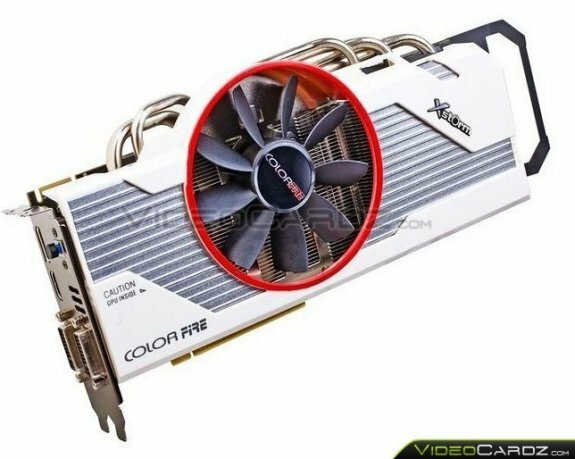 More details and photos of the ColorFire Radeon HD 7870 XStorm have hit the web, this is a new performance-segment card that's so long that it comes with a support brace for workstation cases. Full details at TPU. The card is currently available in China. The card powers the otherwise cool and quiet "Pitcairn" GPU with an 8+1+1 onboard VRM, which can be expanded by a 4-phase VRM card that supports higher power draw. The card draws power from two 8-pin PCIe power connectors. Despite a VRM design that's fit to condition power for the HD 7970 GHz Edition (or jump-start an SUV), the ColorFire HD 7870 XStorm ships with mildly-overclocked speeds of 1050 MHz core and 1250 MHz (5.00 GHz effective) memory. It packs 2 GB of GDDR5 memory across a 256-bit wide memory interface.